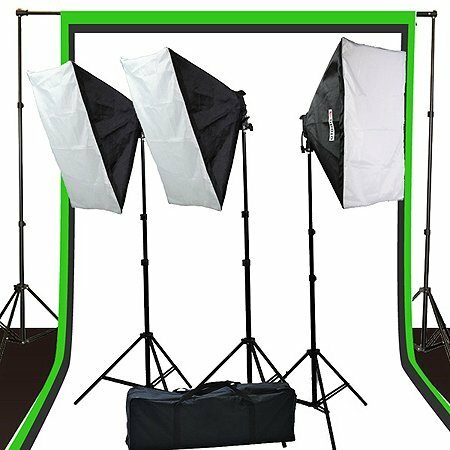 You are buying a brand new Fancierstudio lighting kit 2400 watt photo studio video softbox lighting kit with Backdrop Stand and Three 6'x9' Muslin Backdrop in black white and green screen. What's included is one background support stand able to extend up to 8ft height and 10' wide. The muslin backdrop included is 6' x 9' good enough for any studio shoot. Ultra compact design making this kit the best choice. The Video Photography compact studio kit that gives you over 2400 watts output This kit comes Three 16"x24" softbox for fill light, one for key light. You could use two 4 light heads as your main light and the third as your fill light or hair light. Light output is adjustable with 4 light outputs. You could use them in the studio photography or videography as well as on location projects. This lighting kit is the most affordable kit on the market today. IT is compatible with any camera on the market today like Nikon, Canon, Sony, Olympus and more. Fancierstudio lighting kit 2400 watt softbox light with background stand and three 6'x9' muslin backdrop. Benefits of lighting kit: Continuous lighting is always on, and the obvious advantage to working with continuous light sources is that unlike strobes and monolights, which take a great deal of practice to learn before you understand what changes will look like in a shot, what you're seeing in the real world with continuous lights will closely resemble the image that you're capturing. What you see is what you get and that makes it simple to adjust light positions and output as needed.